Writing a post can take time, effort and skill to bring it to par. More than just content, but readability is needed. Having long, multi-paragraph posts that continue on can wreck havoc on how users view your blog. It can look messy, unorganized, or even like the writer doesnt know what they're doing. Blogging is an extension of your writing, and how your blog, your brand, looks is a big part of that. Help your Posts look they're best by creating a jump. Find out what that is by clicking the "Read More" Button below. There! that wasn't hard! 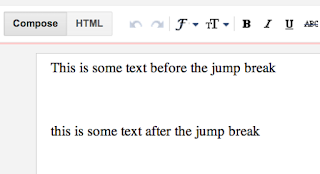 What you just did was use a feature known as a 'Jump' or 'read more' When blog post get too long, instead of having it trail down the main page, you can create a link to the rest of your article. Called 'After the Jump' in Blogger, the feature lets you create an expandable post, using your first paragraph as a summary of your post. Longer posts appear after a link, like the one above. 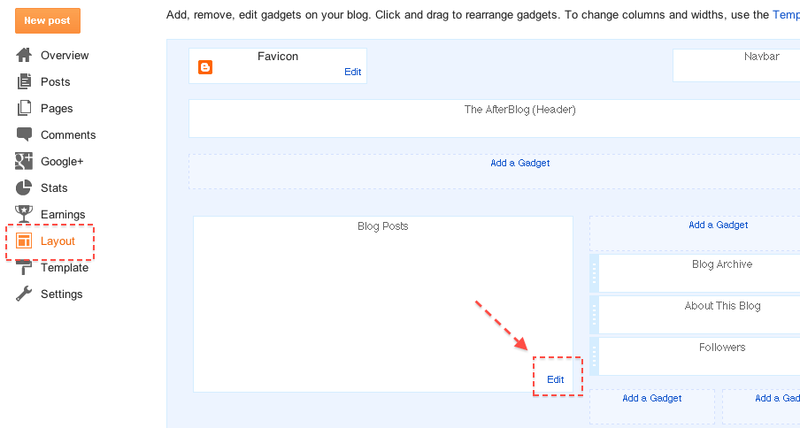 Using Blogger as our platform, creating a break can be easily done right from the post editor. 1. Find a spot where you want to create a break and put your cursor in that spot. 2. Click the Insert Jump Break button in the toolbar. Insert Jump Break by click this icon. This will plant a grey bar the cursor point, indicating where the jump will appear. The Bar can be dragged and repositioned as needed. 3. Once you've got the break in place, you're ready to publish! The 'read more' link will be placed wherever you set the break. Clicking read more will display the entire post. For more advanced customization, you can change the actual text from 'Read More' to any phrase or word. 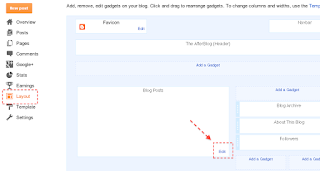 Head to the layout tab and click edit on the blog post widget. Change the post page link text to anything you like. 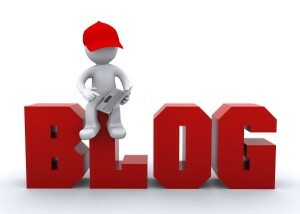 All the posts on this blog, and even the blog itself, change with the content. 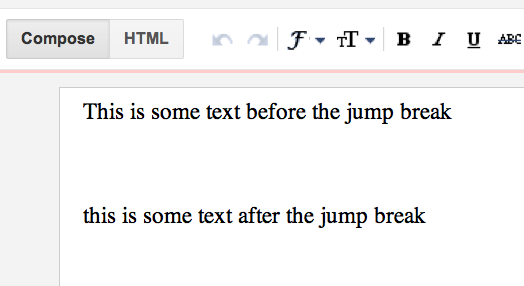 As you can see from the posts below, this blog has never used the jump feature - until now. As we cover new features or ideas for blogs - your blog - they'll get tested out and you can see how they work and look for yourself.